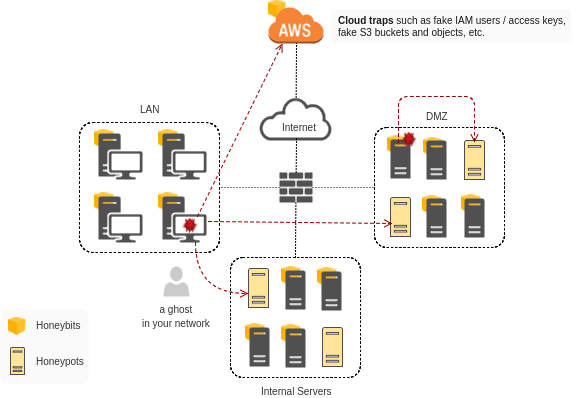 A simple tool designed to enhance the effectiveness of your traps by spreading breadcrumbs & honeytokens across your production servers and workstations to lure the attacker toward your honeypots. The problem with the traditional implementation of honeypots in production environments is that the bad guys can ONLY discover the honeypots by network scanning which is noisy! The only exception I can think of is Beeswarm (it intentionally leaks credentials in the network traffic and then looks for the unexpected reuse of these honey credentials). Fake entries in hosts, ARP table, etc. This is a small but crusial component of your deception system which should also include honeypots (ideally high-interaction ones), Log collection and analysis system, alerting, and so on. Fake PCAP / network traffic containing credentials and etc.